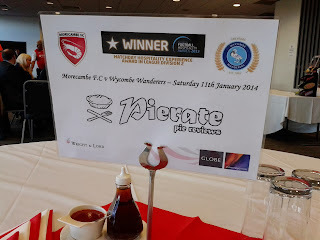 Pierate - Pie Reviews: Morecambe FC - We Ate All The Pies! 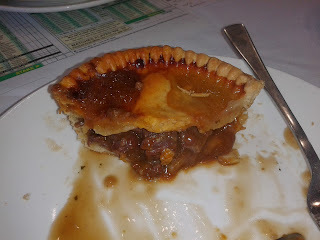 Way back in the mist of time we reviewed a Potts Pie because they were rated as the number one football pie (served at Morecambe Football Club) by the man who ate all the football pies, Tom Dickinson. 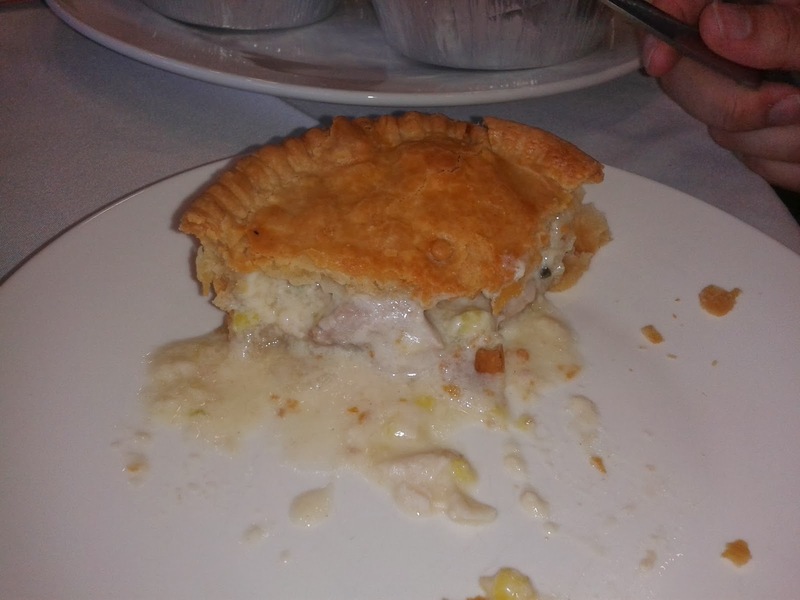 This was in fact our first ever pie review on Pierate. Shortly after this review Morecambe got a new head chef, Graham Aimson, who took the brave decision to replace Potts Pies with his own homemade pies in the hospitably suite at Morecambe. These pies were so popular they soon rolled them out over the whole ground. Given that we have now reviewed over 300 pies we thought it was about time The Pierateers paid another visit to see how these new pies fared! 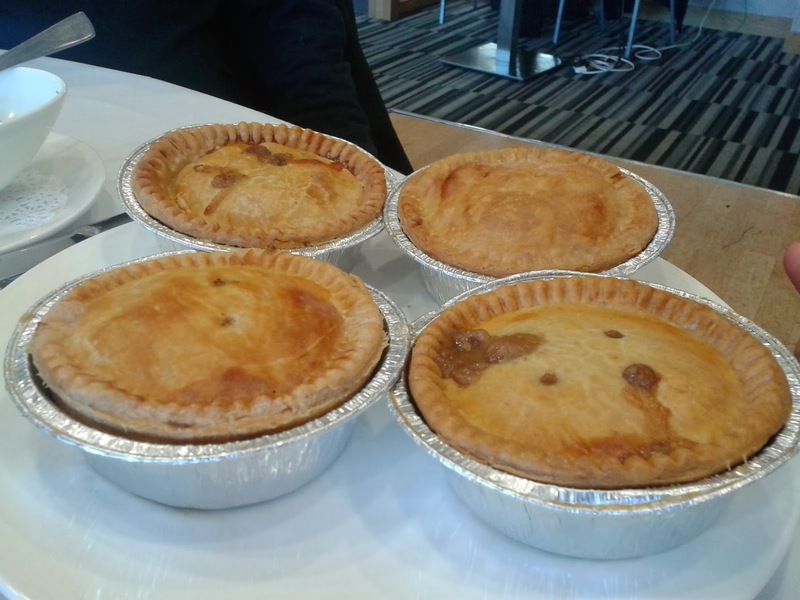 The decision to serve their own pies has paid off with Morecambe FC winning the Best Football Pie award at the British Pie Awards 2012 for their Steak and Ale and the Supreme Champion award at the British Pie Awards 2011 for their Chicken, Ham and Leek. They have continued to have plenty of success and publicity since then, winning further awards and appearing on a number of TV programmes such as The Hairy Bikers. The expectations were already high before even eating the pies! Pierateers RAS and SJL were treated to a pie tasting session before the Morecambe vs. Wycombe game at The Globe Arena. This involved a selection of all four pies that they were selling that day. There were mushy peas and gravy on the side, which is the tradition at the ground, but the Pierateers went for the pure pie experience given that there were so many pies to eat! Everyone at Morecambe was really excellent in putting in the extra effort to make The Pierateers feel welcome. All the people involved were friendly and there was plenty of interest in our pie reviewing. The staff at Morecambe even carried out our first video interview, with the Pierateers in the Kit Room! The pies arrived in fantastically perfect Condition considering that they were handmade. There was a little boil out with some of them but only enough to indicate that the inside promised to be packed with content. We were fortunate as we were so close to the kitchen these were some very fresh pies! They were all a lovely golden brown Colour. These pies were quite tall which gave them a good filling to pastry ratio and a large Capacity. Despite being tall they had a good structural rigidity which meant they held together well. The pie plus peas and gravy costs £2.80 which we thought was superb value for inside a football ground, especially given that the pies are made on the premises with quality ingredients. For all these pies the pastry was a shortcrust. It looked like it might be hard but it in reality it was quite soft and thin. There was a bit of crunch around the rim which added to the texture of the pie. It wasn’t dry and didn’t need the optional gravy jug, it was nice enough to eat the pastry by itself. Pierateer SJL felt the pastry was nearly spot on although Pierateer RAS would have liked it just a tad lighter but still thoroughly enjoyed it. This pie might be the lowest scoring but it was still a pie that The Pierateers would recommend. The filling was as you would expect with a traditional meat and potato pie, minced beef with soft pieces of potato. The softness of the filling meant chewing was not really necessary and it slipped down well. However, this by no means meant the filling was mushy, there was still some firmness to the potato. There was a nice meatiness to it, a bit of pepperiness. We would, for our ideal pie, want something a bit more to bite into which is where it lost some score. 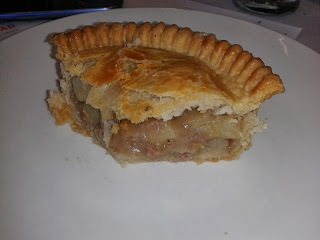 However, this still makes it the highest scoring meat and potato pie we have reviewed. There was plenty of lamb in the pie and it tasted of good quality, in nice big meaty chunks. The addition of some root vegetables was welcome. This really added to the texture of the pie. 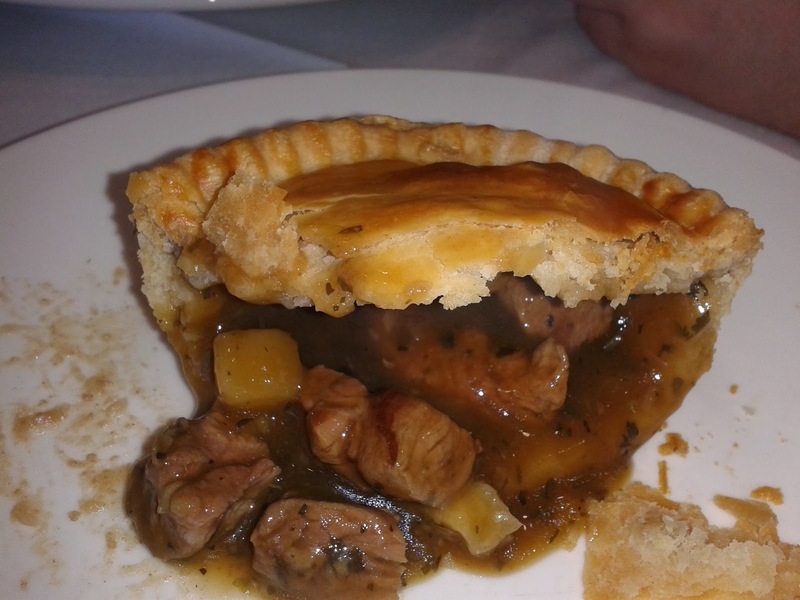 This lamb pie did do something unusual compared to many others we have reviewed as it contained mint sauce gravy. It tasted a bit sharp because of the vinegar and hence may not be to everyone’s liking. The sauce was also a little thinner than the others. This was one The Pierateers were especially excited about because many people had said it was their favourite. The pie filling seemed really meaty with a rich chicken taste. The Pierateers noted that the ham flavour wasn’t particularly strong in this pie although this wasn’t necessarily a bad thing. The leek added plenty of flavour and the pie certainly tasted homemade. The chicken was fibrous and clearly of good quality. There was a good balance of flavour with the leek leaving it anything but bland but not being overpowering. One thing that stopped it being The Pierateers' favourite was the fact that the sauce was fairly thin-ish. It seems that this may have been because a lot of pies had to be cooked quickly because the game was in doubt due to the weather. Here it is, the Supreme Champion of the Morecambe Pierate Awards 2014, the Morecambe FC Steak and Ale! Both SJL and RAS were in agreement that this was their favourite pie. This was not just a Steak and Ale with a deep meaty taste. It had more flavours to it than that. The Pierateers suspected that it had tomato in it and chef Graham confirmed this to be true. There seemed to be other additions too which meant it really did stand out as different to other Steak and Ale pies. There were nice big chunks of Steak with plenty of sauce which was thicker than that with the Chicken, Ham and Leek. A pie which left you wanting more but not through lack of size. Overall, a real set of winners for Morecambe even if they couldn't get the win on the pitch, coming from behind to draw with Wycombe Wanderers 1-1 in a game which suffered from the muddy pitch. These scores see the Lamb and Mint and the Meat and Potato gain Pierate 'Recommended' status, while the Chicken, Ham and Leek and Steak and Ale gain the highly sort after Pierate 'Highly Recommended' status. At half time the Pierateers were delighted to find there was even a separate Apple pie waiting for them! It stands out that Graham is a high class restaurant chef. He is not just making pies by numbers, they are well thought out pies which are anything but average. There is no question that these are the best pies we have ever eaten at a football ground, just have a look at our football pie league. It isn't much of a suprise in some ways, we have been to very few grounds where they make the pies within the stadium kitchen itself. 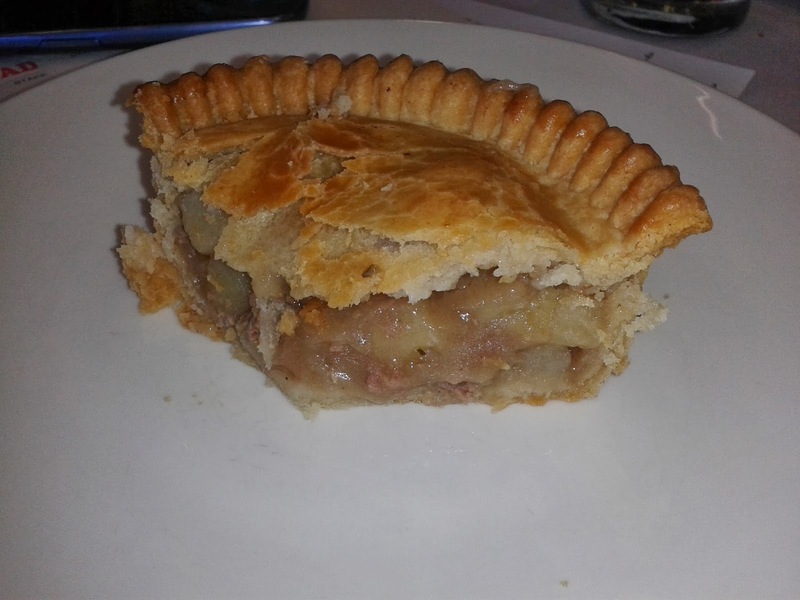 As usual, quality ingredients, an eye for detail and a labour intensive process mean that these pies are head and shoulders above the reheated, mass produced pies normally sold at football matches. We all know pies and football are a match made in heaven, but with pies that taste this homemade The Globe Arena should be the football ground where even the away fans feel at home. Thanks again to Mike, Head Chef Graham and everyone at Morecambe Football Club for such a great day. Thanks for your message. I'll tweet Graham for you and see if he can reply to you on here!